President Donald Trump questioned the legality of the appointment of special counsel Robert Mueller on Monday while indicating that he will let the Russia investigation proceed. The president issued his message one day after The New York Times published leaked confidential letters from his attorneys to Mueller. In the letters, Trump’s legal team exhaustively addresses Mueller’s queries but never challenges the legality of the special counsel’s appointment. Trump’s message on Monday suggests that his attorneys may expand the field of legal confrontation with Mueller by questioning the legality of his appointment. Since Attorney General Rod Rosenstein appointed Mueller more than a year ago, legal experts pointed to at a range of reasons for why the appointment may be in violation of the law. The law guiding the establishment of a special counsel requires that a specific crime is investigated. Collusion is not part of any United States statutory law, except for anti-trust issues. Rosenstein appointed Mueller to investigate allegations of collusion between the Trump campaign and Russia. Since these allegations are not a crime, Mueller’s appointment is not in line with the law governing the special counsel. None of the people indicted by Mueller have been charged with collusion. Mueller is also potentially acting beyond the already vague scope. Lawyers for former Trump campaign manager Paul Manafort sued the Justice Department arguing that Mueller acted outside his prescribed scope in indicting Manafort for crimes allegedly committed over a decade ago. “By ignoring the boundaries of the jurisdiction granted to the Special Counsel in the Appointment Order, Mr. Mueller acted beyond the scope of his authority,” the lawsuit states. 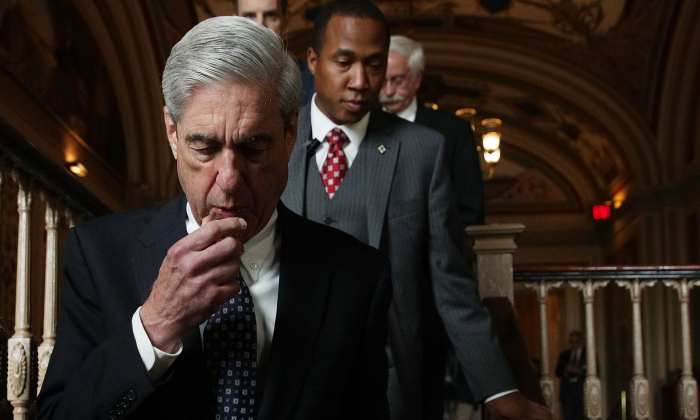 Since Mueller has been a long-time colleague and friend of former FBI Director James Comey, a conflict of interest was created when the special counsel expanded his investigation to include the possibility that Trump obstructed justice in firing Comey. Rosenstein signed at least one warrant application to a secret court to surveil Trump campaign volunteer Carter Page. These warrant applications are now subject to intense criticism because the senior officials involved in signing them knowingly used an unverified anti-Trump dossier funded by Hillary Clinton’s campaign as the core of the rationale for surveillance. Republican lawmakers issued a referral for criminal investigation for several officials involved in signing the warrant applications. Trump has often described Mueller’s team as “13 Angry Democrats.” A number of people on the special counsel’s team have donated to the Democratic party and candidates. One team member, Jeannie Rhee, worked as a lawyer for the Clinton Foundation. Campaign finance reports show that Rhee donated the maximum contributions of $2,700 to Clinton in 2015 and 2016. Two former members of Mueller’s team, Peter Strzok and Lisa Page, were revealed through their text messages to have an intense bias against Trump, going as far as discussing an “insurance policy” in case Trump won. Attorney General Jeff Sessions recused himself from all matters rel toated the 2016 presidential election campaign. But in appointing Mueller, Rosenstein authorized the special counsel to investigate matters well outside issues involving the election. Mueller’s indictments substantiate this argument. Mueller indicted Manafort for crimes allegedly committed over a decade ago as part of an investigation that started well before Trump announced his run for president. As a result, barring a private arrangement, Rosenstein acted outside his authority by granting Mueller the authority to investigate matters which could only be granted by Sessions. The Appointments Clause in the constitution requires that principal officers must be nominated by the president and confirmed by the Senate. As an example, U.S. Attorneys are principal officers and are appointed by the president because they have broad independent authority to pursue cases. Mueller’s appointment is different from prior special counsels because Rosenstein granted him an overly broad investigative scope. Rosenstein also does not direct Mueller’s ongoing work, making Mueller’s power equal to or more than that of a U.S. attorney.